From time immemorial the Mikvah has been the foundation of Jewish family life. Now after decades the Florida Keys and Key West has a beautiful new Mikvah. It is a haven of holiness for the community. The Mikvah is enhanced with fine work of tile and glass. There is a luxurious changing room and parking. The word "Mikvah" means "a gathering of water" natural water. Built according to exact rules of dimension and acceptable source of natural water, a Mikvah is a small pool, usually about four feet deep, filled with clean, clear water. On Masada and in ancient Jerusalem you will find Mikvahs uncovered after thousands of years. They testify to the historic continuum of the tradition of Mikvah. 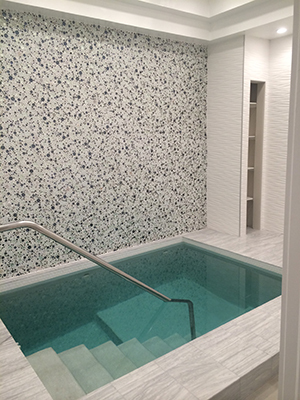 Today, most Jewish communities boast a Mikvah that is modern and bright with beautifully appointed preparation and dressing rooms and a Mikvah pool that is heated and scrupulously clean. In Hebrew, natural spring water is called "living water". With its clear waters, the Mikvah is a powerful symbol of life and rebirth. Throughout our history, the ritual of Mikvah immersion has been a means of spiritual purification, helping us prepare for events of great spiritual significance. In ancient times, the high priest of the Temple in Jerusalem immersed himself in the Mikvah five separate times during the services for Yom Kippur, each time reaching a higher spiritual level. In our time, the Mikvah is mainly used as a vital part of the Laws of Family Purity. As it has always been the role of a Jewish wife to set the spiritual tone of her home, it is the Jewish wife who ensures the spiritual dimension of the intimate marriage relationship.